Thank you to Nature Nate’s for sponsoring this delicious recipe and craft tutorial, as always all opinions are my own! Last weekend my boys requested we make a new, fantastic “sweet treat” together with some Nature Nate’s Raw & Unfiltered Honey they had their eye on in the pantry. They love helping me create new recipes – especially if they get to taste-test! 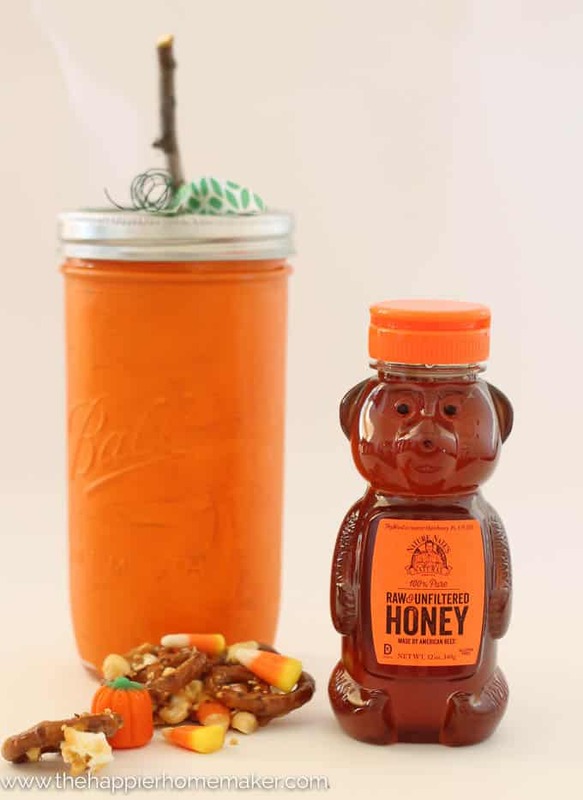 I thought it would be fun to make a snack mix that we could gift to some family friends we were seeing soon, so we gathered some of our favorite ingredients and mixed them up together to make this flavorful Harvest Honey Snack Mix. 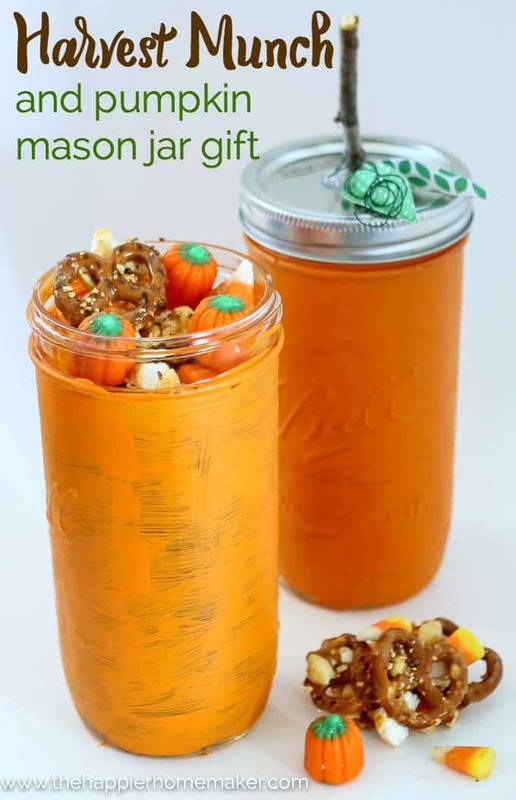 We also created some adorable Mason Jar Pumpkins to gift the mix in – and they were a huge hit! Line two baking sheets with parchment paper. 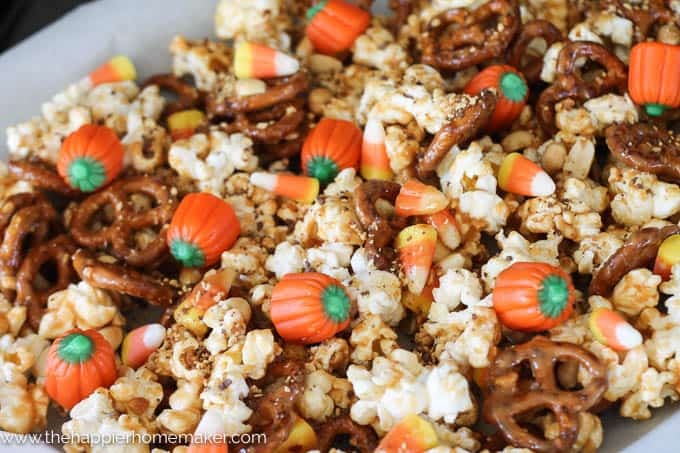 In a large mixing bowl combine popcorn, pretzels, candy corn, and nuts. Stir to combine and set aside. Combine butter, peanut butter, honey, sugar and salt in a small sauce pan and heat over medium heat, stirring constantly until boiling. Reduce heat and simmer an additional 2 minutes, stirring as needed. Pour the mixture over the snack mix and stir until coated. Spread snack mix on the baking sheets and allow to cool. After cooling, break apart and mix with candy pumpkins and serve! 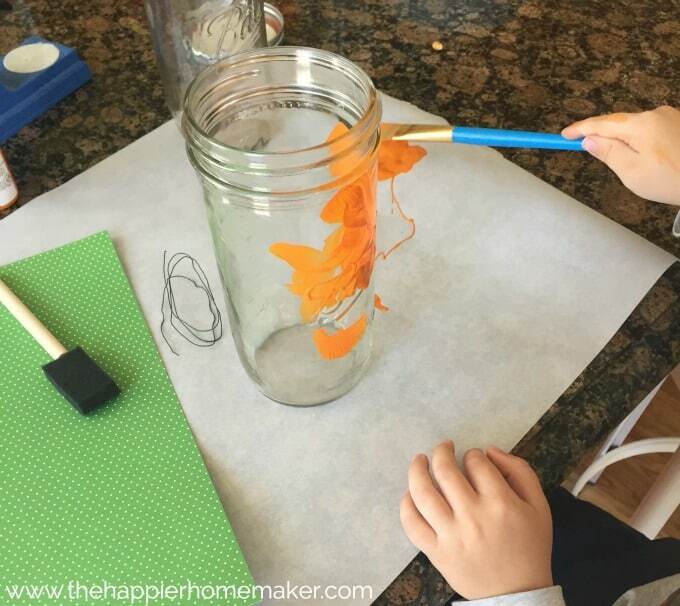 While they were painting I assembled the “stem” of the pumpkin on the lid. 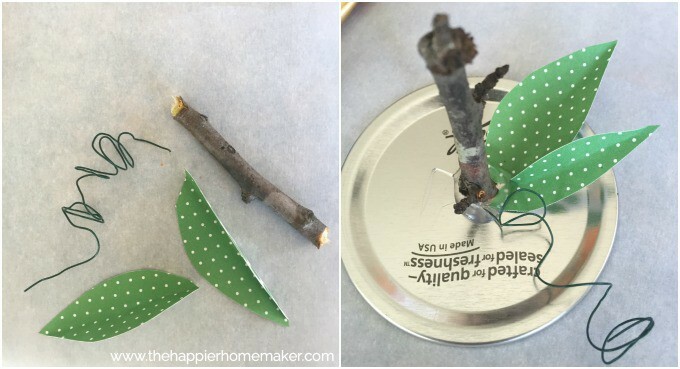 I used a stick, scrapbook paper cut in the shape of leaves, and some floral wire to act as a little vine. It was easily attached with a glob of hot glue. Then we simply packaged up our snack mix and it was ready to brighten someone’s day! 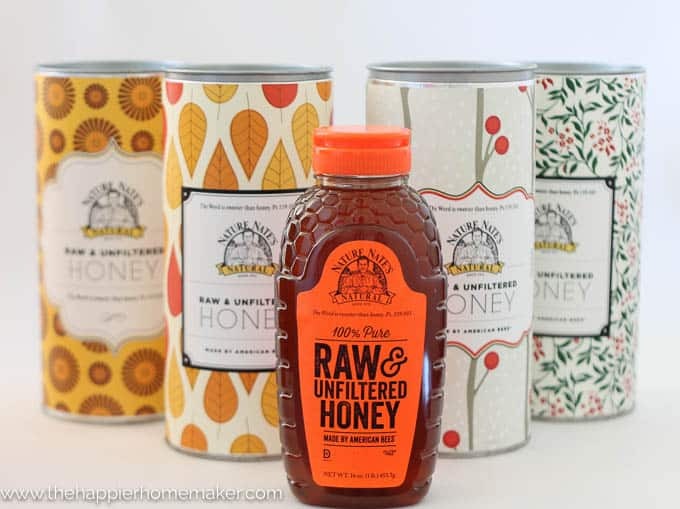 Have you tried Nature Nate’s Raw & Unfiltered Honey? It’s made from 100% American bees and treated with very low heat, keeping those important enzymes intact. It’s also unfiltered, which means it still contains pollen and retains the best flavor, aroma and nutrition naturally. I’m planning to gift this honey for Christmas – you can order it in these gorgeous tins – aren’t they beautiful? They would make the perfect hostess gift or stocking stuffer too! 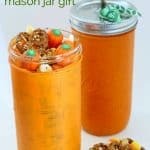 This delicious peanut butter honey flavored Harvest Munch snack mix is the perfect party food or snack and makes a fantastic gift as well! 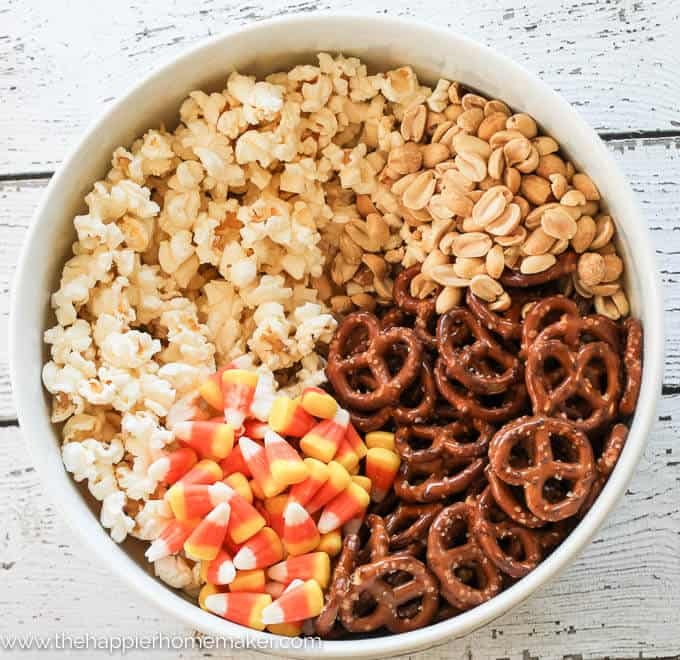 In a large mixing bowl combine popcorn, pretzels, candy corn, and nuts. Combine butter, peanut butter, honey, sugar and salt in a small sauce pan and heat over medium heat, stirring constantly until boiling. Reduce heat and simmer an additional 2 minutes, stirring as needed. Pour the mixture over the snack mix and stir until coated. Spread snack mix on the baking sheets and allow to cool. After cooling, break apart and mix with candy pumpkins and serve!